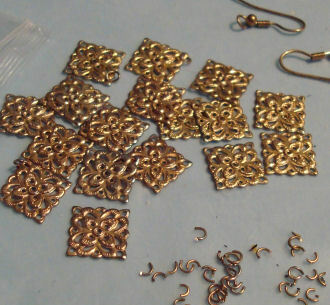 I love jewelry findings and find myself pawing through them frequently looking for possible new combinations and uses. This process may serve the same kind of purpose as all that grooming monkeys do for each other. Have you ever noticed the glazed look in the eyes of both the groomer and groomee? 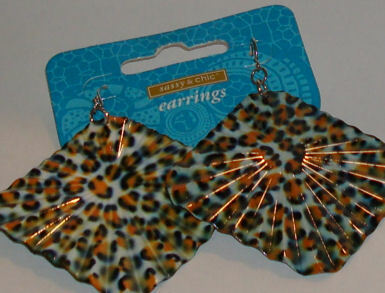 These strange earrings will make great table tops in my Safari roombox one day. And when I saw this, it reminded me of baby teeth. "Buried" in the ground maybe these can become part of a Tooth Fairy's fence, or as stepping stones, or ....! I found this quite gaudy pair of earrings for $3 at the Goodwill Store. 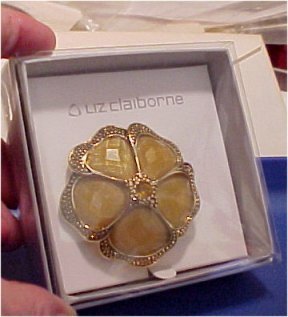 However, what I saw was not the jewelry but all those little filigree squares. I think I counted eighteen little squares; plus the hooks. 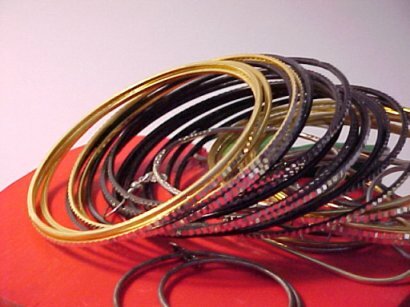 AND those little cut pieces of o-rings make great handles on cups, or coffee pots and teapots in small scales. This silk scarf clip makes me think of feathers. Aha! It can become a footstool cushion or perhaps a pillow in my upcoming chicken shop. 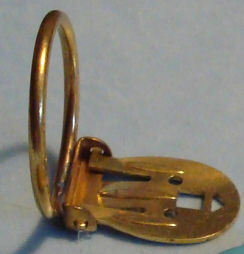 The clip itself could become a brass picture or mirror frame or needlework holder. It stops at any angle, too, which makes it quite useful, perhaps as a makeup mirror. 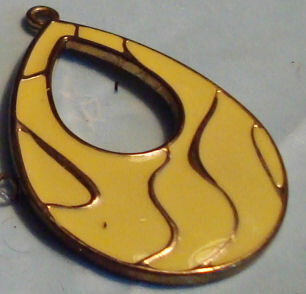 This single earring suggests eggs to me, so it could become either a frame or a mirror in the chicken shop. 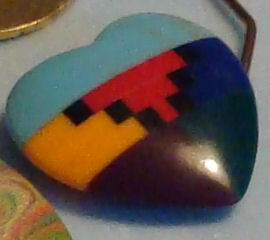 And surely I can find a place for this little SW looking heart! Well, hmm. All I can think of is a fat little blue moon, maybe to go in my wizard setting with all those moons and stars and suns and such. 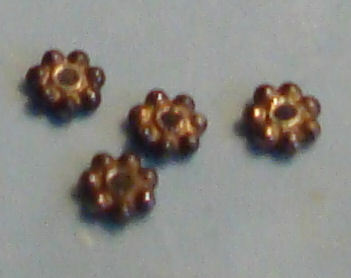 Well, these very tiny little thingies could become something in quarter scale, I suppose. I used some that were larger in an earlier Cheap Thrill which you can see here if you scroll down to Easter egg candlesticks. 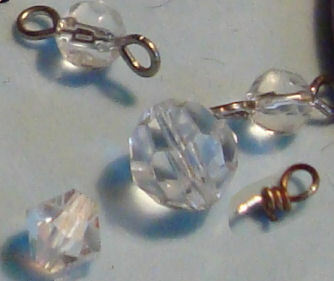 Well, a miniaturist can never have too many clear and faceted beads, right? And even that tiny little hook will work somewhere. So, yes, Pat, I can use that little bag of goodies! 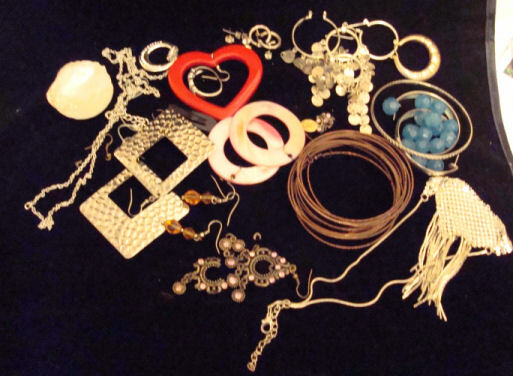 While I was in Denton, TX, in the summer of 2008, my great-niece Ashley was intrigued when she learned how I use jewelry findings, and cleared out these items from her jewelry box to see if I could use them. As we looked through them, I told her how each might be used for this or that. Before we had finished, SHE was picking up jewelry pieces and saying, "You could use this for a picture frame (or a lamp, etc. ), Aunt Wanna!" I love it when somebody else gets the Mini Eye! Even though this is intended to go over the necks of bottles, it is still jewelry of a sort, according to my classification! I found this recently at the dollar store. It's supposed to go around the neck of a bottle; not sure why. I was intrigued with all the scrolls because it reminded me of snails, and then I remembered Gastro Podd's house and thought maybe I might use them to make some kind of furniture trim or accessories. 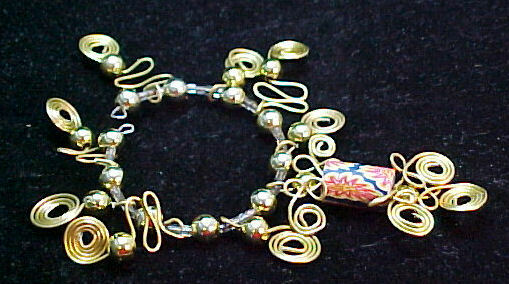 Even if I don't know for sure what I'll do with it, just look at all that's there for 50 cents - small glass beads, gold metal beads, all that nice malleable wire, and even a fancy pendant that looks like a candle. Well, it was too good a deal to pass up. This lucky find was at a local dollar store. As soon as I saw it, I knew it was the shade for a floor lamp. I can't wait to see how it looks in a future scene. These lockets all came from my jewelry box. They have possibilities as picture frames in special settings. 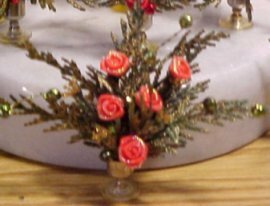 The little rose locket has pictures of Dawn dolls. 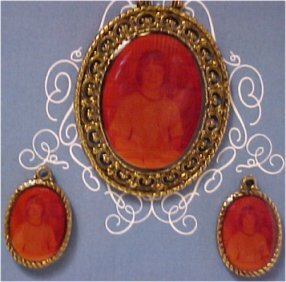 My goodness, my daughter used this locket as a double picture frame in her dollhouse in the 70's. 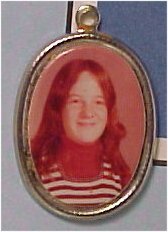 And here she is as she looked then in a locket that came along with her school pictures. She wasn't much older than her daughter Jenna is now. Unfortunately, there was something lacking in the color film used in those days. It hasn't held up well. See what I mean? This was my son Jeff along about then and he's almost gone in a red blur! 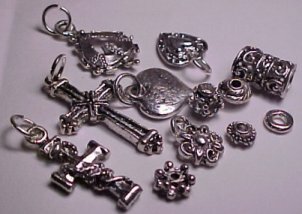 Among my purchases at a local Dollar Store were some "silver" bracelets. 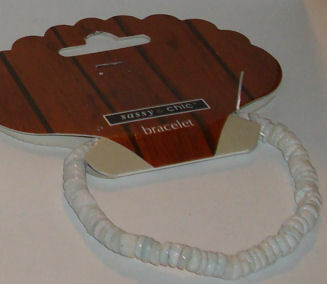 Here is a sampling of some of the various parts, which were threaded on thin clear plastic cords. I wanted to cover up the "silver" to get a better idea of how I might use some of them, so began painting the findings off-white as a primer for "tooth" that latex paints would stick to. This look comes from applying a stain. The cross might look okay (after removing the silver hanging loop) as part of a wall grouping with art work, etc. It also might make a good base for a small shelf. 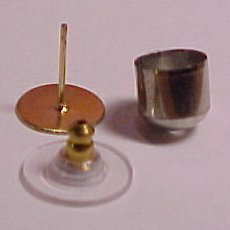 The hollow finding on the right is tapered slightly at the ends. Since it doesn't stand up straight, it can't really be used upright. However, it reminds me of an interesting carved box that I saw in a Mexican import shop. 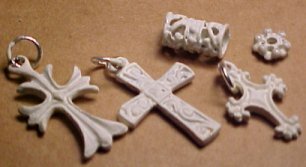 I think I will fill it with Sculpey so that it looks like solid wood, add a knob on top, paint the box brown iron oxide and apply a stain that will emphasize the "carving." 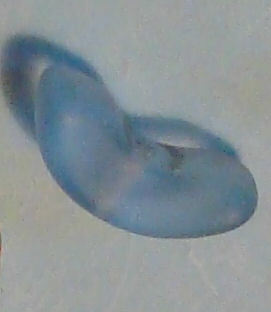 With a coat of paint, the knobby circle finding, which is about a quarter of an inch or less wide, reminded me of Easter eggs. So, I decided to experiment. My first efforts involved using paint pens, but I wasn't satisfied with the look and went back over the eggs with acrylics. Then I painted the other areas green to suggest grass. It was very tedious getting the green in between all the eggs, and if I were to do this again, I would try painting all the bases solid green first, then paint the eggs. On the other hand, the colors might not show up as well over the green. The Easter eggs looked a bit too bright to me, so I coated one with a glittery pearl paint, another with a glittery crystal and went over a third with a stain pen. I liked the look of the stain pen best, so that's how I finished all of them. Now that I had Easter eggs, what to do with them? I decided to make a cakeplate and candleholders. 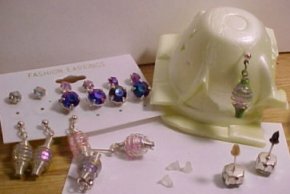 For the base I used an earring post, painted the same green as the Easter "grass." Using a bit of Tacky glue and a drop of super glue, I slid the eggs onto the post, then slid a yellow seed bead on top of that. Next, I added a pearl bell finding, upside down. 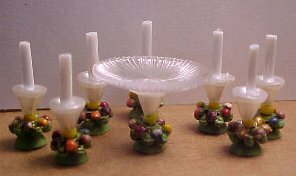 Here is the cake plate and some of the candleholders; I think there were 12. The candles were made of white bugle beads (I'm thinking about adding a black thread as a wick), and the plate was made of a plastic disc with a hole in the middle. I don't recall where it came from; wish I had more. 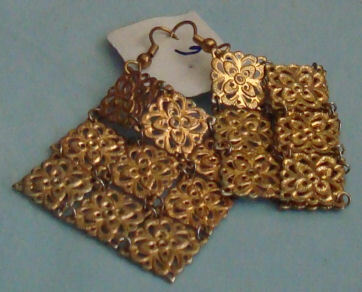 I found these earrings in a basket at the Goodwill Store. I can see the two parrots as mirror frames in either a garden or tropical setting, or even in a child's room with a jungle theme. I can also see the elephant one as a picture frame in a child's room. 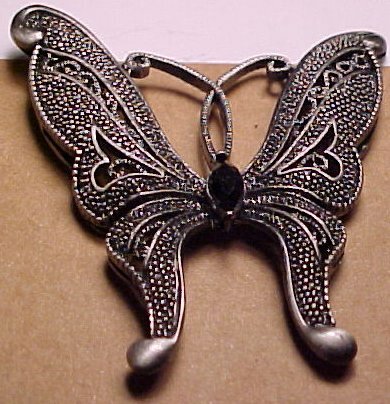 This inexpensive locket on a chain came from Big Lots, I think. 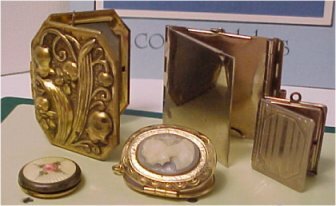 The fine chain has many uses, and I plan to use the locket as a double picture frame on a dressing table I am working on for my daughter. 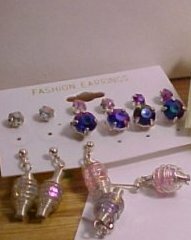 I bought this card of earrings at the dollar store because I thought the dangly ones looked like miniature lanterns. 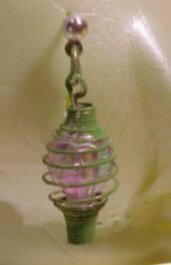 Here is the miniature lantern, painted green, which I was thinking about using in my fairy nursery. There were six of these, so that should be enough to suggest that the fairies can see the babies in the nursery at night. They are probably powered by magical fireflies. 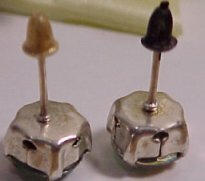 I was intrigued with the fasteners, as well. Hmm, now what do these remind me of? For a dollar, I have six fairy lanterns and twelve bells/witch's hats. Not bad! 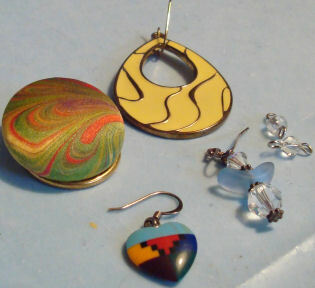 As yet, I haven't figured out what to do with the "precious stone" earrings, but something will probably come to mind. If nothing else, they could become jewels in a pirate's chest, or some fabled Sapphires so large that kingdoms crumbled and lives and fortunes were destroyed when it was in someone's possession! 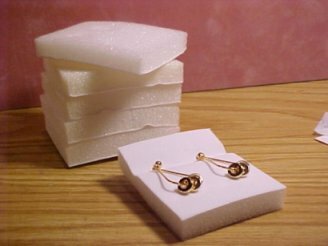 Here are the earrings broken into their elements. I will save them all in my findings drawers for future projects. The catch, along with another earring catch, and this little finding together should make a nifty little flower container. 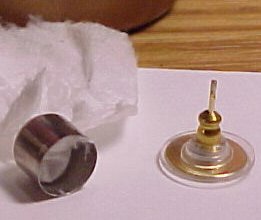 Notice that the stem, once the two parts are stuck together, is a bit short, which means the "vase" will wobble. So, a bit of Kleenex glued inside will help anchor it. I used white glue along with a drop of super glue to attach the vase to the stem. When it dried, I put more glue in the vase and inserted a piece of brown floral foam to serve as the base for my arrangement. 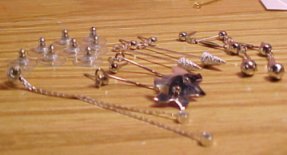 These are the remaining pieces of jewelry that I bought that day - not because I wanted them, necessarily, but because I wanted the boxes they came in! However, they have possibilities, too. Of course, we've already seen the clasps at upper left in use as the base for a flower vase. 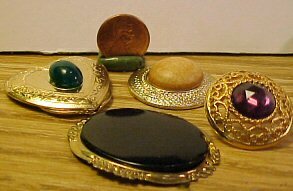 They can also work upside down, stacked with other findings to form candlesticks, epergnes, etc. Notice the silver cone shapes; I can just see those as elegant trees in a quarter scale setting; can't you? They could also serve as finials in an Art Deco window treatment .... Ah, the possibilities. Here are some earrings and pins from the dollar store. With their centers removed, I could see them as jewelry or food trays; the two on the right as bases for floor lamps, etc. 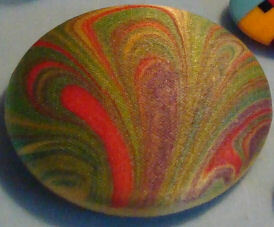 When I removed the center on this one, I noticed how much it looked like a round loaf of bread! Didn't even have to repaint it! NOTE: Do you notice how some of these pictures have a yellow cast? I was beside myself, trying to figure out what was wrong with my trusty digital camera that I love. 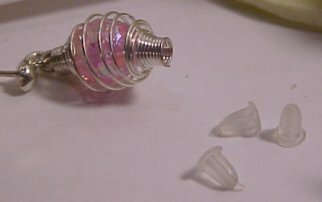 What I didn't know was that my husband had replaced the regular lightbulb in my worktable lamp with one of those cost-saver fluourescent bulbs with the weird shape. It might save some money but it sure distorted colors on my worktable. So I now have my old lightbulb back.